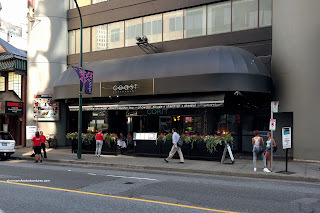 "When was the last time you visited Coast? 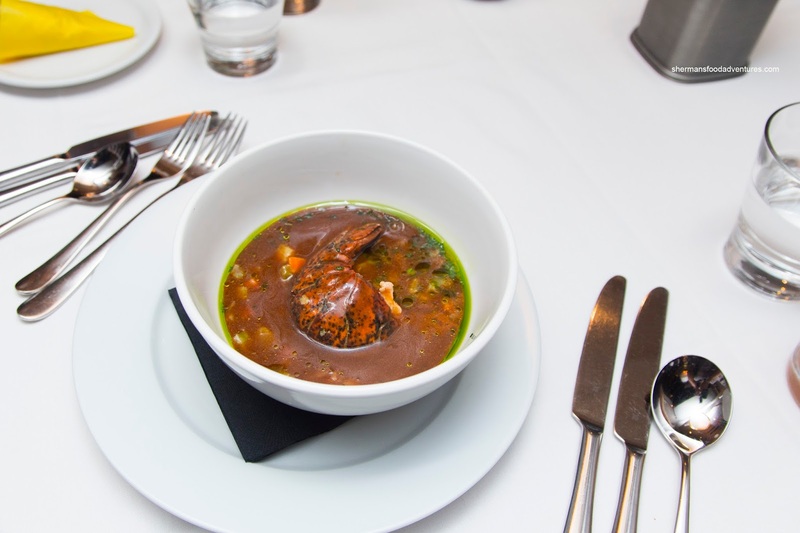 ", I was asked on this invite to try the place out after a management change that saw the main players from Joe Fortes move over. I sheepishly drew a blank because other than a media dinner a few years ago, the last time I actually ate at Coast was 7 years ago! Not that the place was bad per se, I just had other places to go. Now with the aforementioned team including colourful Maitre'd Frenchy and Operations Manager Scott Garrett as well as changes to parts of the interior and some menu items, I was curious to see what they had in store. 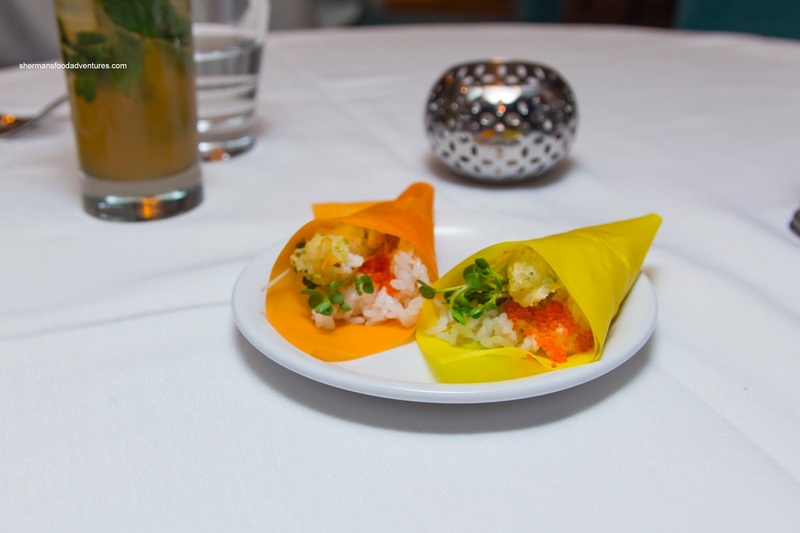 As an Amuse Bouche, we were served the Fish & Chip Cones with sushi rice, tempura cod and spicy mayo wrapped with colourful soy paper. These were super light with only minimal amount of chewy sushi rice and a flaky piece of fish. The tempura batter was crispy and airy while the spicy mayo was impactful. We decided to try the Lobster Chowder which was really a brandy lobster bisque with an Atlantic lobster tail (and several chunks of lobster as well). Normally, I find bisques rather heavy, overly creamy and salty. This one here was the complete opposite where it wasn't reliant on salt. Rather, it featured concentrated lobster shell aroma and brininess. We found the amount of brandy spot on where it was definitely noticeable. The cones and soup were good, but really, the thing we were looking forward to most was the Coast Tower. This 3-tiered beast featured both Dungeness and Snow Crab, Scallop Ceviche, Albacore Tuna Gomae and Wakame Salad on the bottom. 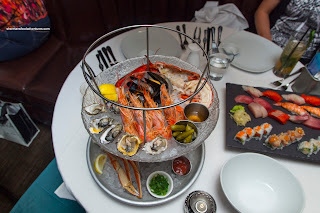 In the middle, we found half of an Altantic Lobster, Oysters, Mussels and Prawns. 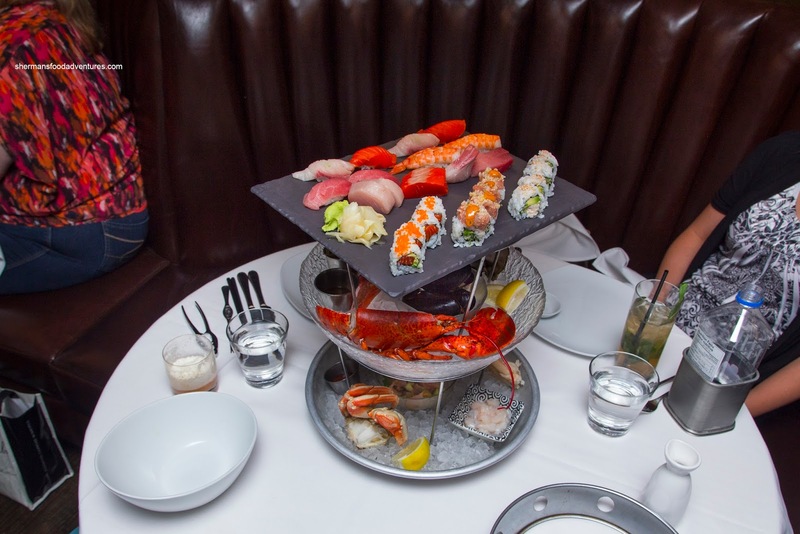 The icing on the cake (or tower in this case) was a sushi tile consisting of Nigiri, Sashimi and Sushi Rolls. In fact, it ate as good as it looked with fresh slices of sashimi consisting of red tuna, buttery hamachi, Atlantic salmon and albacore tuna. There was also a selection of nigiri where there was only a modest amount of chewy sushi rice. 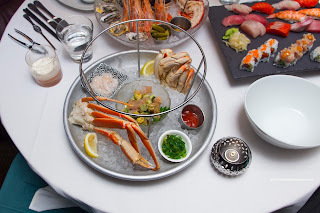 As mentioned, the bottom tier sported Snow and Dungeness Crab, Scallop Ceviche, Tuna Gomae and Wakame Salad. We found the ceviche to be buttery soft and naturally sweet. Both types of crab were fluffy and on point texturally. They were sweet and briny. Although the tuna in the gomae was fresh and buttery, we would've liked to see more dressing. On the second tier, the half-Lobster was a treat being meaty and cooked just enough where there was a nice rebound. Mussels were plump and sweet while the Prawns were equally sweet albeit a touch overdone. Oysters were shucked properly with no shell fragments while being intensely sweet and bright. 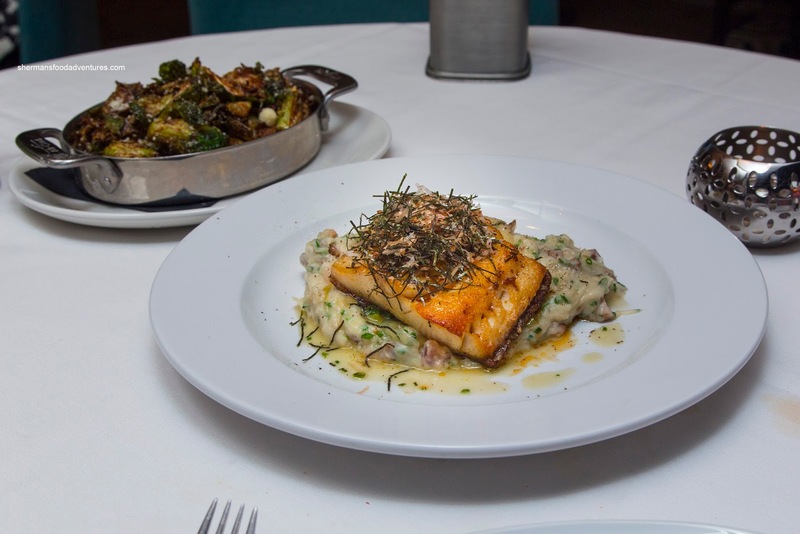 For good measure, we got one hot dish in the Miso-Maple Sablefish with sake-butter braised leeks and chive smoked bacon mash. This fish was prepared properly being buttery and flaky with a sweet and salty glaze. The topping of shredded nori and bonito added some extra seafoodiness to the fish. Creamy and smooth, the mash was smoky, yet not salty while nicely brightened up by the chives. 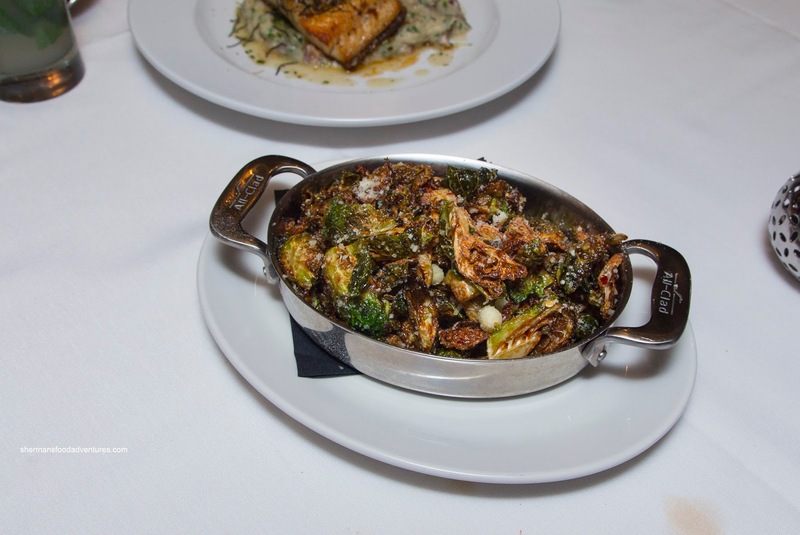 Of course we couldn't get out of there without ordering their signature Brussels Sprouts with capers, lemon, Parm and chili. These were like I remembered being crispy and impactfully spiked with flavours that backed up the description. Loved the amount of acidity and spice. For dessert, we shared the Coconut Banana Butter Cake with rum caramel, creme Anglaise and strawberries. This was served warm being aromatic and of course buttery. It was not as sweet as I expected despite the caramel and sauce. 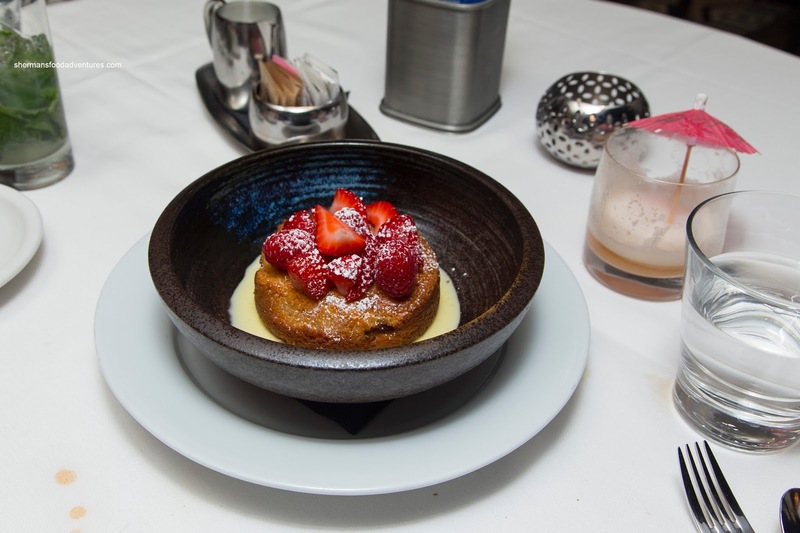 The little nuggets of banana were sweet surprises while the tart strawberries helped balance the richness. This was a nice finish to a surprising evening. I've never been shy in the past about my thoughts about the Glowbal Group, but it appears good things are brewing here at Coast after a management change. I look forward to see the many changes that are in store.